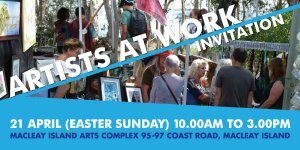 Please join us for a day of fine art, pottery, sculpture, weaving, food and great company on the coastline of Macleay Island. Allow your eyes to feast upon colour, shape and form as brushes, pens and crayons turn canvas, paper and other materials into works of art. Experience timber, clay, silver and fabric being transformed into objects of beauty. You will be able to purchase original work from artist’s in situ or from the gallery exhibition. Great food all day with BAR-B-QUE lunch cooked by the Macleay Island Renegades Men’s Shed and the Macleay Island Little Bus available FREE for this special occasion- call 0412 913 605.